Crusader : Who Am I ? In the Middle of me is my core which is very hot and made out of nickle and iron. My core is 5000 degrees Celsius. My mantle, my second layer is, is hot molten rock that is rising and sinking. Why does it rise and sink? Well when it rises it cools down and gets closer to the surface from the plates which makes it sink. 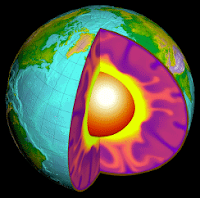 Once the magma gets close to the core at the bottom it makes it rise again. The crust is my third layer. It is made from separate plates. Some of the plates are overlapping and some are reconnecting together because of the hot molten rock. Continually moving underneath it resembles a jigsaw puzzle of me. The crust is the outermost layer. Labels: Crusader, Who Am I ?